Morris (right) beside his wife. Turanga Morris is a middle-aged mutant human who spent his life before the mutant revolution in the sewers. He is happily married to Turanga Munda and they have a grown-up daughter together. The Turanga house in the NNY Sewers (6ACV12). As a mutant, Turanga Morris has some special characteristics: as with his wife and daughter, Morris has only one eye, and he has a sideways mouth. He has gray hair and is balding. In his very first appearance, however, he had a horizontally-oriented mouth, he also appeared to have fangs reminiscent of a vampire. Morris seems to be prone to drinking, both beer and tequila, and he enjoys fishing. He is very friendly and dedicated to his daughter Leela up to and beyond the point he'd rather die than let something bad happen to her, though like his wife he always fear (or even suppose and accept) that she might be ashamed of her parents. He and his wife own a mutant cat with a tail that is a snake. He later remarks that he's allergic to animals when trapped by the Zookeeper (4ACV04), leading one to theorize that he is only allergic to non-mutant cats. He lived in a small house in the sewers up until the Devolution Revolution of September 3010, when they were allowed up on the surface (6ACV12). Turanga Morris was married to Turanga Munda in 2972. 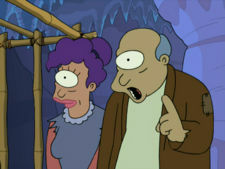 When his daughter was born the "least mutated mutant ever" three years later, he and Munda conceived a plan to give the newborn a better life on the surface, by leaving her on the steps of an orphanarium, keeping Leela from living "the horrible degrading life of a mutant".. Munda used her Ph.D. in exolinguistics to write a note in Alienese, so people would think she was an alien rather than a mutant. The note read "Your parents love you very much", but was never properly translated. Both swore to rather die than let her daughter know the "shameful truth of her origin." Grandfather to several dozen of Amphibiosan offsprings that Leela is the biological mother of; however, Amphibosan culture considers Amy Wong to be the true mother of Kif's offspring. Morris: No beer until you finish your Tequilla! Munda: [About Leela after her birth.] She's completely perfect! Morris: Fine, Sweetiekins, we'll be the strictest parents ever. Now, let's all have some tequila to celebrate! Morris: Oh, right. Here's a silly straw. 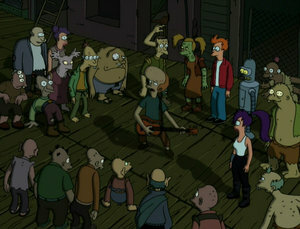 Leela: And if some kid picks on me, my dad can beat up his dad. Morris: Can't I just beat up the kid? This page was last edited on 5 October 2013, at 20:39.